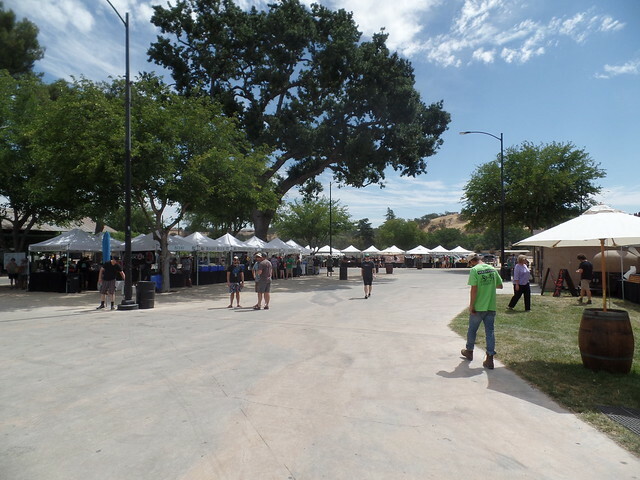 On Saturday, the 5th annual Firestone Walker Invitational Beer Festival was held in Paso Robles, California. 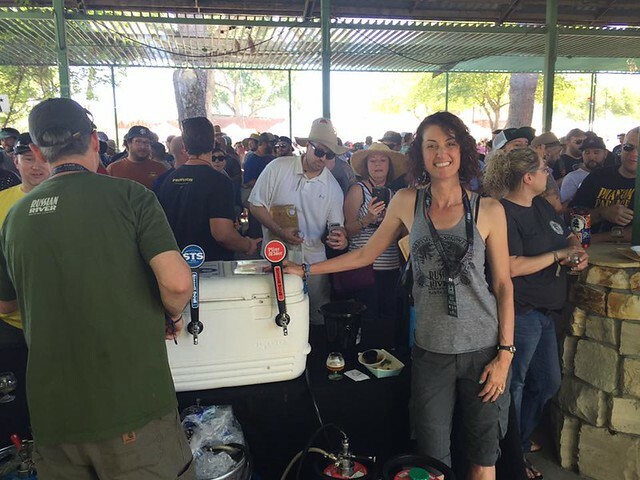 Although a relatively new festival, it has quickly become one of my favorite not-to-be-missed events of the season. The brewery describes it like this: “The Firestone Walker Invitational Beer Fest is an epic yet intimate gathering of 50 leading brewers from around the nation and world, celebrating craft beer in our hometown Paso Robles.” What sets it apart is great organization, a well-curated selection of brewers (who are each asked to bring a sesssionable beer and something special), lots of food, music (and perhaps more importantly, lots of areas that are quieter should you prefer that), along with many, many small details, diversions and things to do. 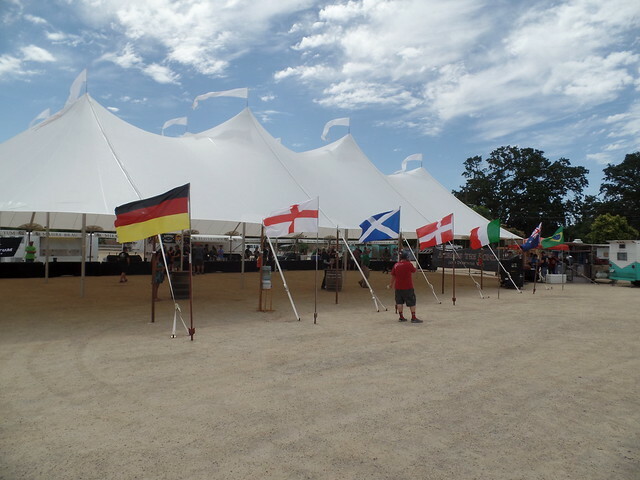 This was another great year, with plenty of wonderful sensations to eat and drink. Here is a photo essay of the day. 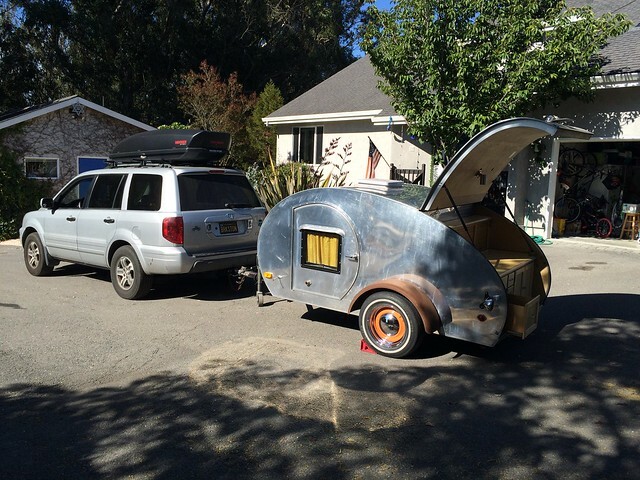 Our weekend started by picking up the teardrop camper we rented the night before. 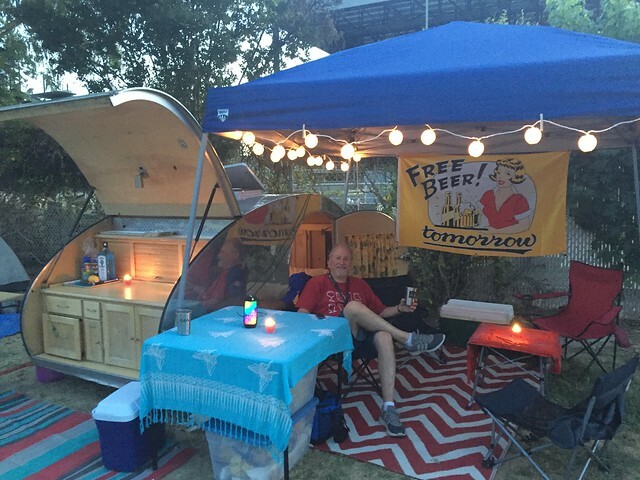 Which we set up in the camp set aside for brewers and media at the Paso Robles Event Center, on the grounds of where the festival would take place the next day. 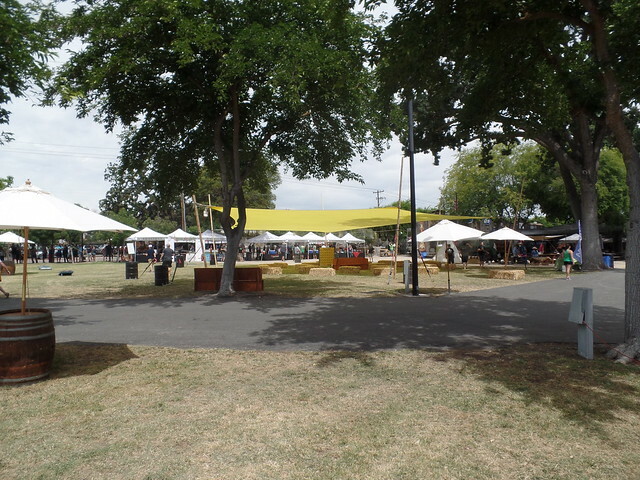 Two shots of the festival grounds before it began Saturday morning. The calm before the storm. 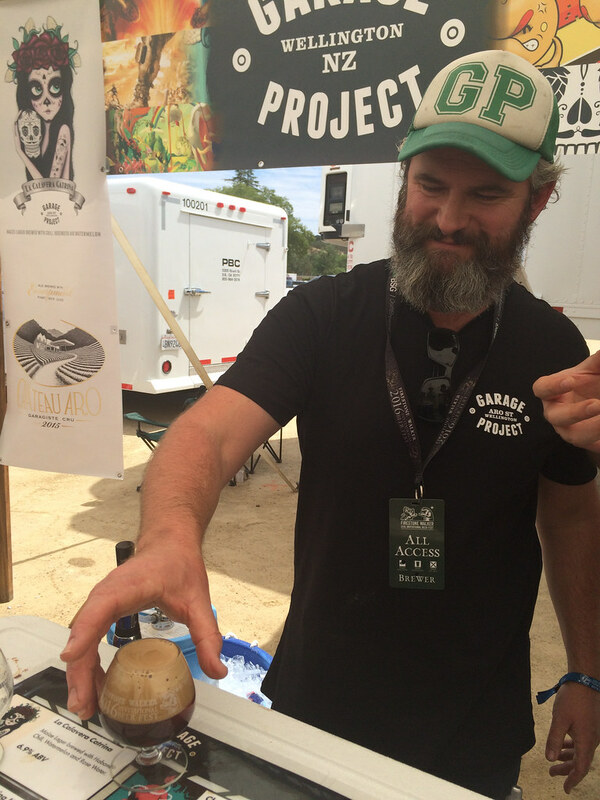 This year, a separate tent housed all of the breweries from outside the U.S.
For example, Pete Gillespie from New Zealand’s Garage Project Brewery, was pouring a very interesting beer, with a great presentation. 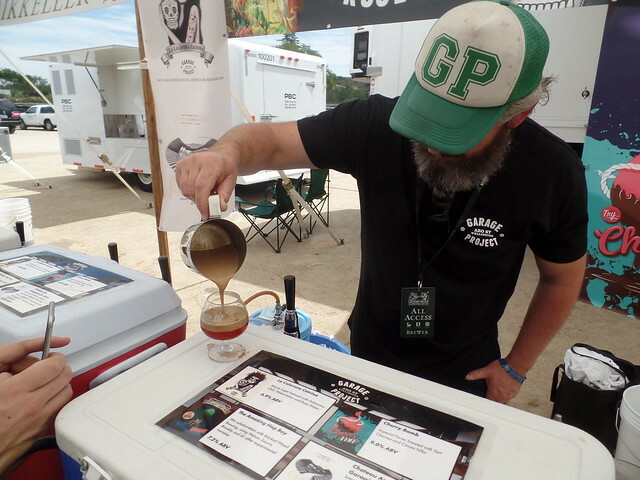 Essentially a deconstructed Imperial Porter, Cherry Bomb, first they pour the cherry-based beer, and then on top of that is added chocolate foam from another tap that was drawn into a metal cop. It stayed fairly well separated until you drank it, then it began to mix together. 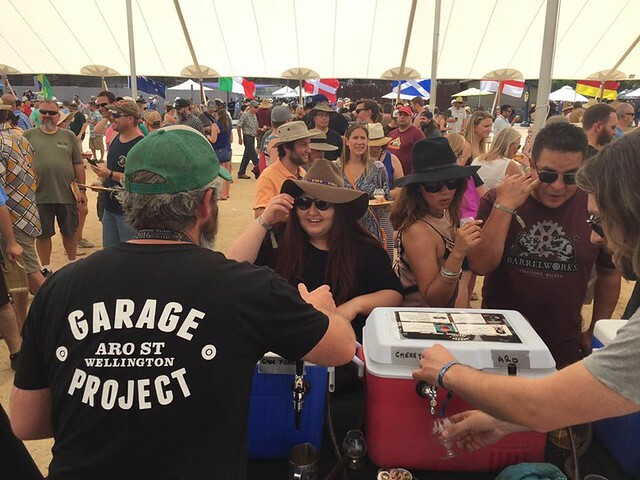 In fact, Garage Project had well-deserved long lines all day long. 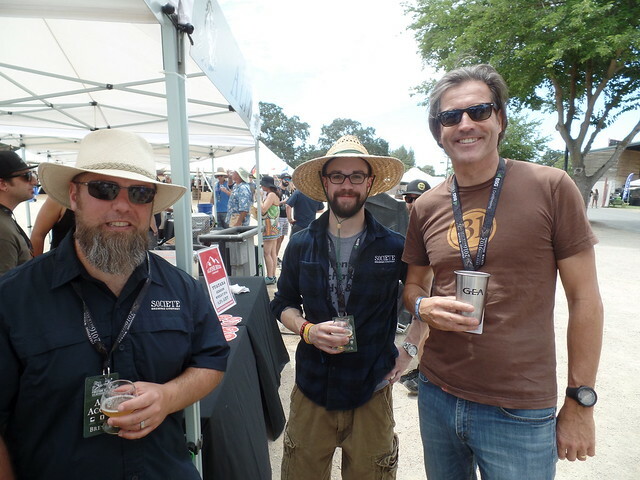 Travis Smith and Mike Sardina, both from Societe Brewing of San Diego, with David Walker, co-founder of Firestone Walker. 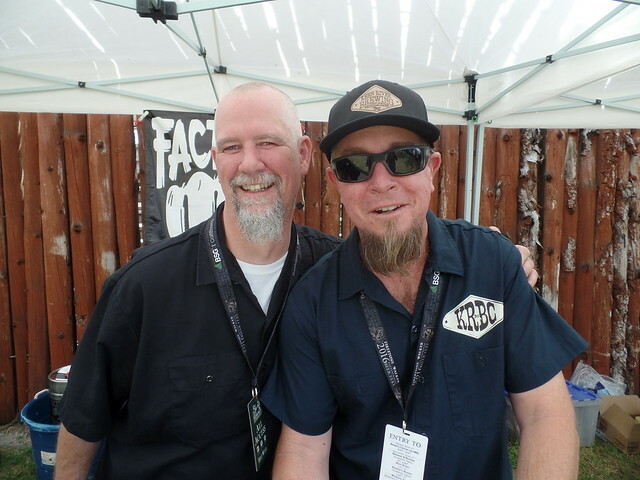 Rodger Davis, from Faction Brewing, and Kyle Smith, from Kern River Brewing, behind their respective booths. 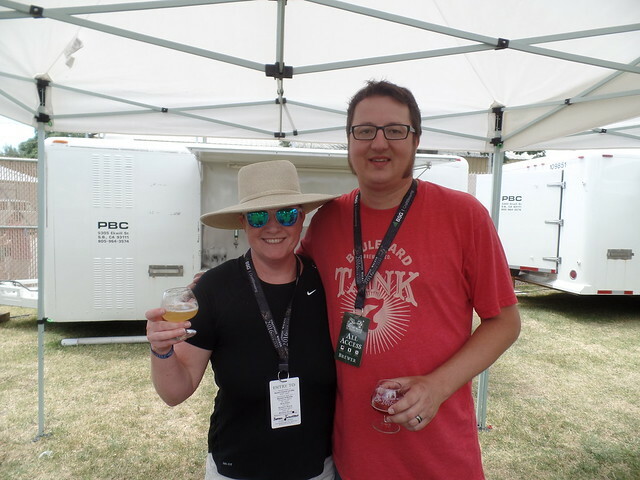 My wife Sarah with the great Jeremy Danner, from Boulevard Brewing in Kansas City. It was a fairly hot day, 100+ degrees, but we were prepared. 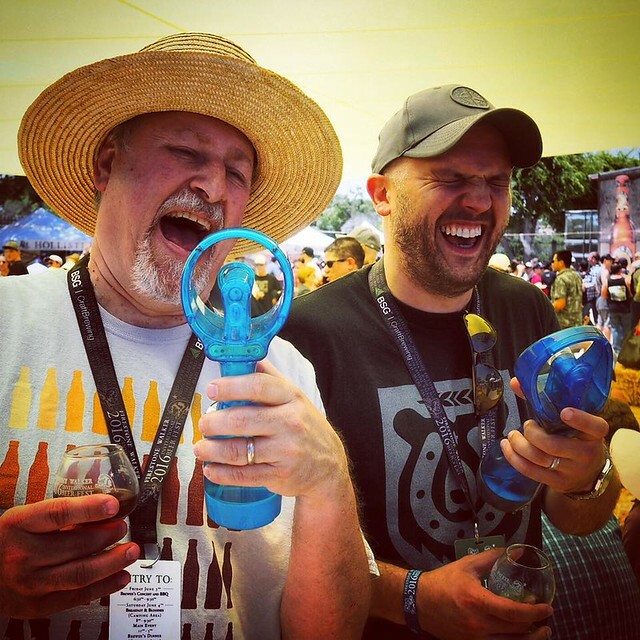 I wore my Amish hat, and both Ken Weaver, from All About Beer, and I both brought spray bottle fans. When we posed with them, I sprayed Ken just as this photo, taken by Jon Page, was snapped. 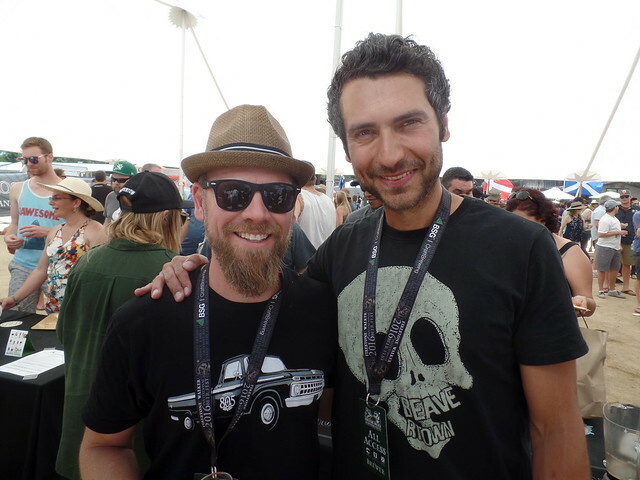 Firestone Walker brewmaster Matt Brynildson with Logan Plant, from Beavertown Brewery in London. 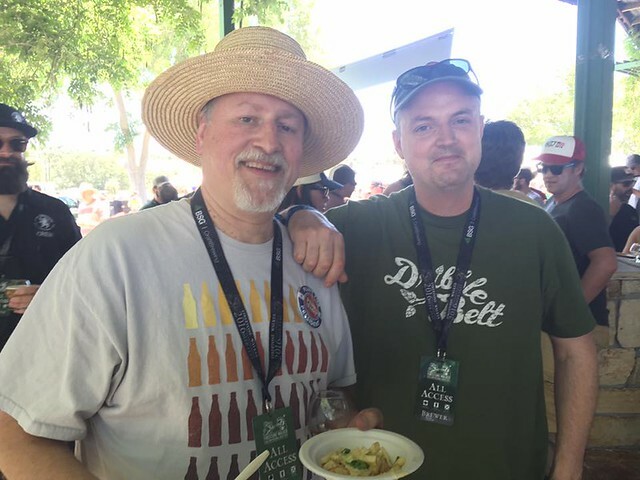 As usual, the food was great, and even one of the vendors was serving frites, specifically truffle fries with parmesan, which I shared with Vinnie Cilurzo. 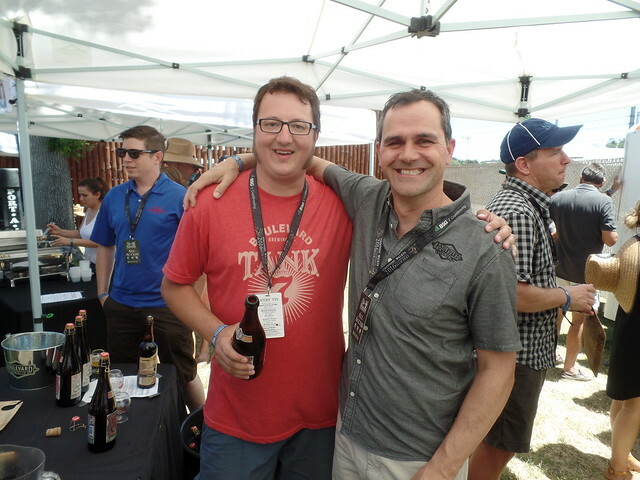 Jeremy Danner again, this time with Boulevard brewmaster Steven Pauwels. 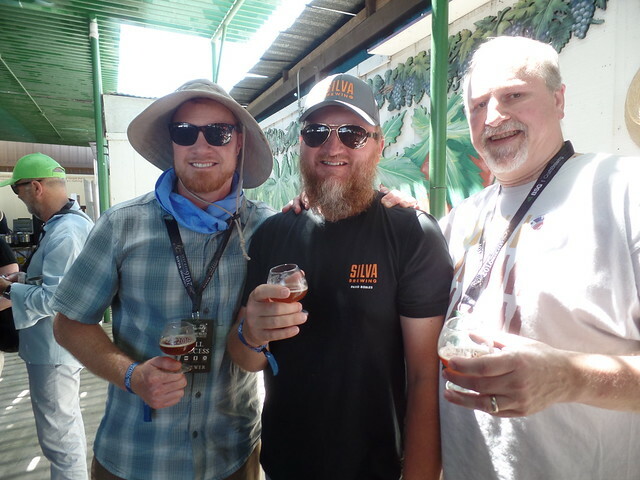 With Chuck Silva (middle), former brewmaster for Green Flash Brewing, who’s working on his own place, Silva Brewing, which he’s hoping will be open by fall of this year. 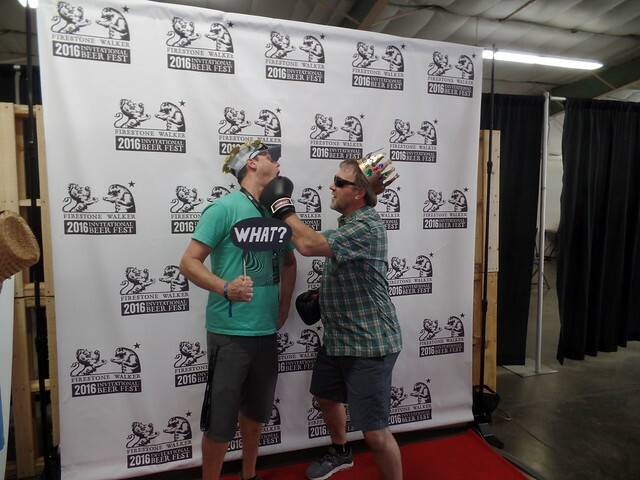 Terence Sullivan, from Sierra Nevada Brewing, beating up a buddy from Chico at Firestone Walker’s photo booth. 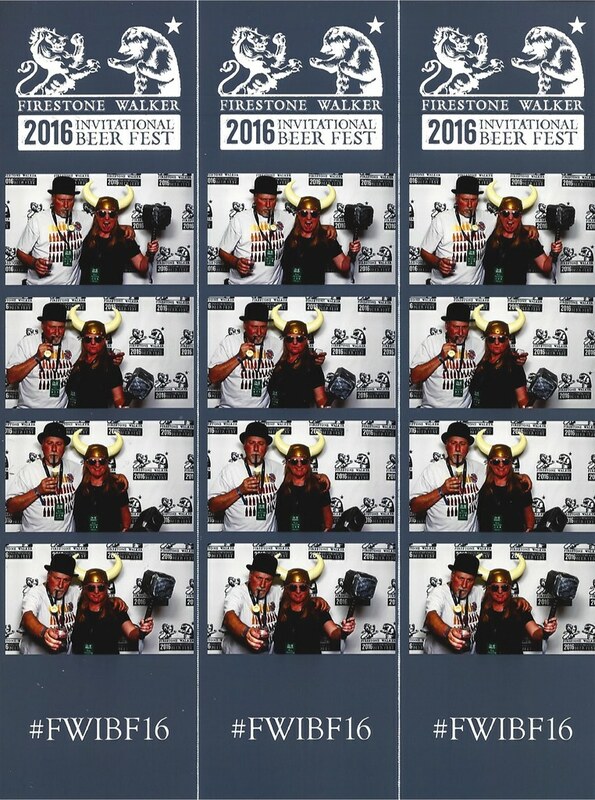 And this is our own series of photos from the photo booth. 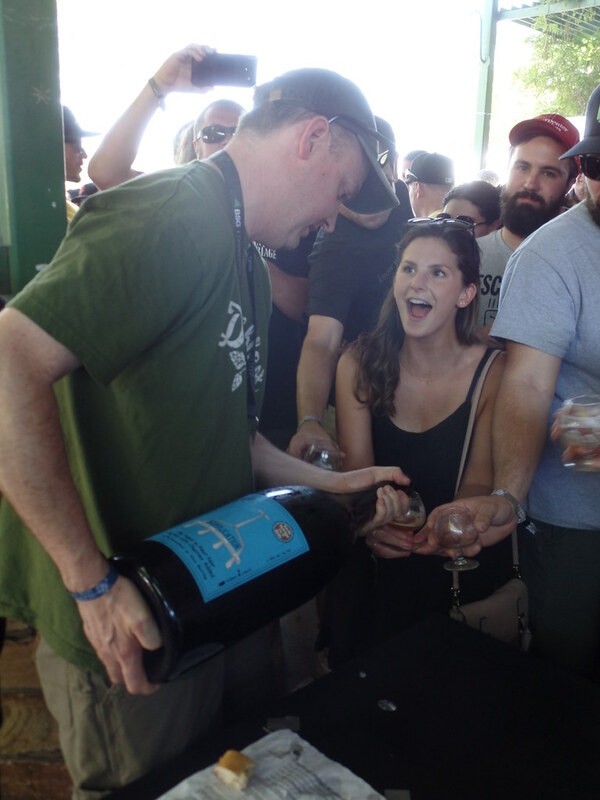 The Russian River Brewing booth was also busy all day, which kept their staff busy. 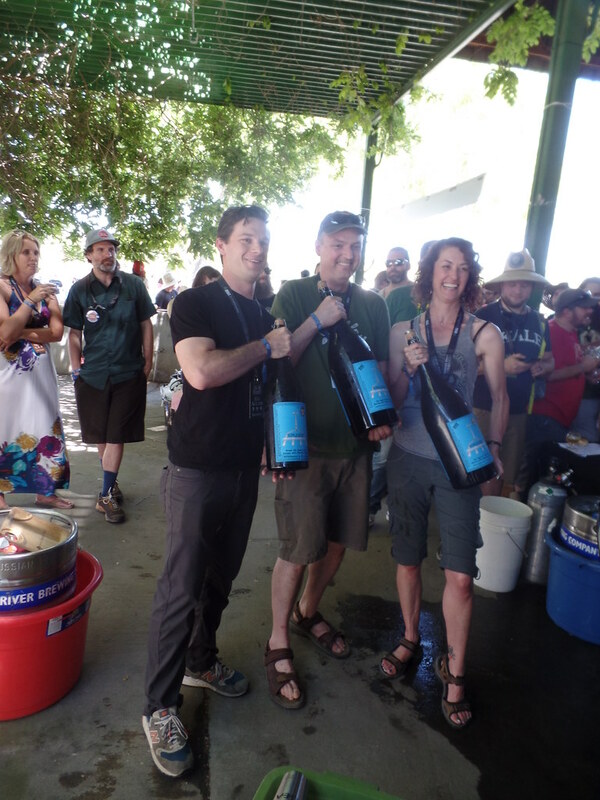 At precisely 2:23 PM, Russian River Brewing opened three seven-year-old bottles of Supplication. 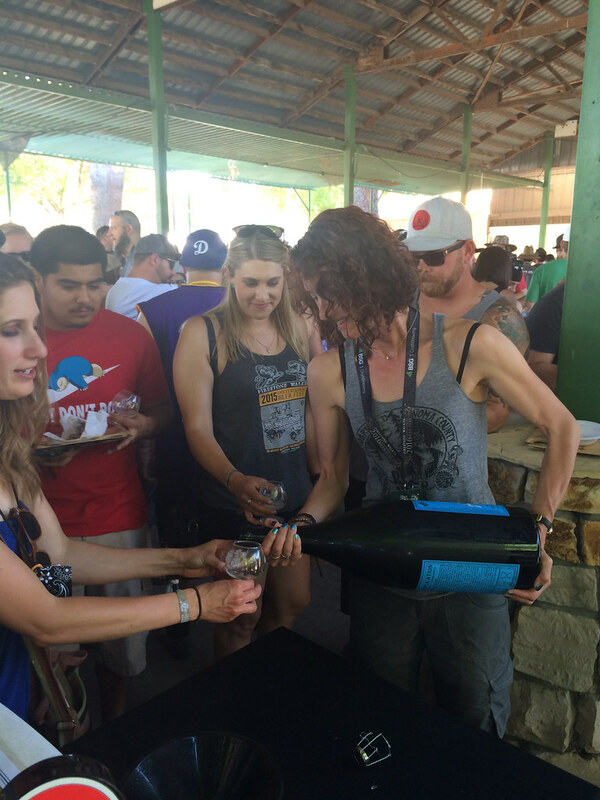 Then both Vinnie and Natalie each poured samples from each of their 6L bottles to people in the crowd, and continued pouring until they were empty. 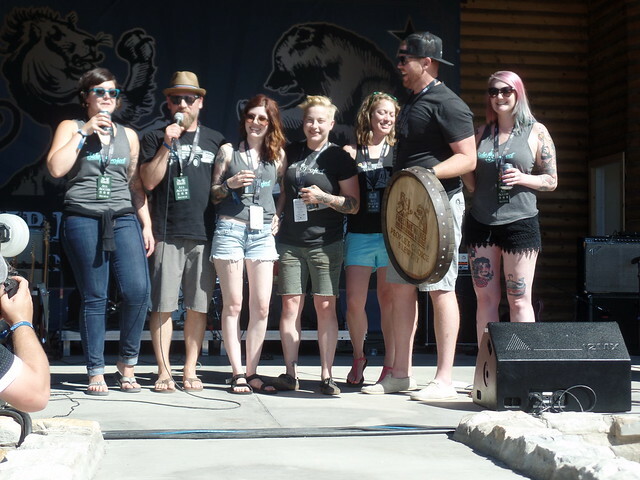 At the end of the festival, the voting for people’s choice was announced, and this year was one by Side Project Brewing from St. Louis. 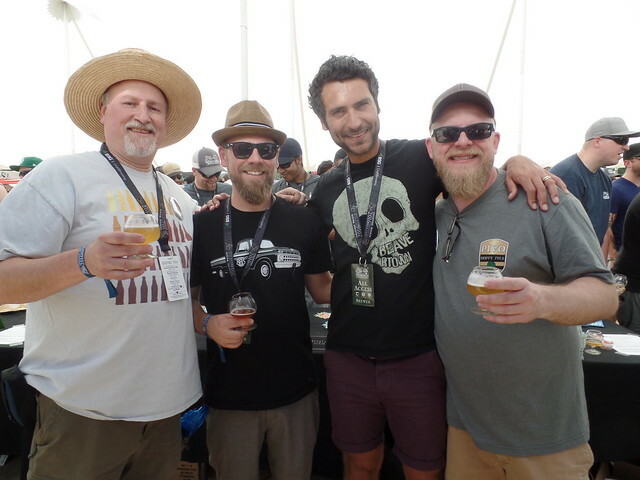 Me, Matt Brynildson, Logan Plant and another Firestone Walker brewer.